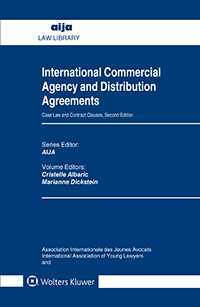 International Commercial Agency and Distribution Agreements is a much-used practical guide to drafting and negotiating commercial agency, exclusive distribution, and franchising agreements. In this enriched second edition of a proven, indispensable practical guide, the contributors have all updated their country reports with recent cases and commentary and an abundance of new sample clauses and other practical features. In addition, four major jurisdictions – Brazil, England, Japan, and the United States – have been added, bringing the total number of country reports to nineteen. Local experts provide detailed information on specific applicable law, major current case law, drafting guidance with specific clauses, and official English versions of relevant primary material. Case law summaries clearly expose the issues from which disputes arise, – and the financial consequences of those disputes – and the practical discussion includes sample clauses designed to anticipate those issues and avoid the pitfalls to which they often lead. This book helps the readers gain a comprehensive understanding of legislation, regulation, and case law affecting distribution agreements in major jurisdictions worldwide and thereby confidently approach the contractual specifics and possibilities offered in each jurisdiction. The ready-to-adapt contractual clauses provided on a case-by-case basis serves as a handbook to corporate counsel, legal scholars, and other lawyers negotiating international commercial distribution agreements.